For over a year now, the VDW has been work­ing with eight mem­ber com­pa­nies and five con­trol man­u­fac­tur­ers to cre­ate an open inter­face for con­nect­ing machine tools to high­er-lev­el IT sys­tems. The project orig­i­nal­ly oper­at­ed under the some­what unwieldy title “Con­nec­tiv­i­ty for Indus­try 4.0”. 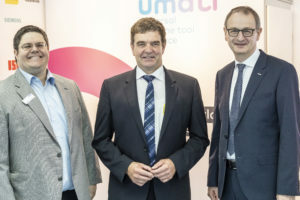 VDW even­tu­al­ly launched the umati brand for the project at AMB 2018 in mid-Sep­tem­ber in Stuttgart. Every­one in Stuttgart was famil­iar with the name umati from the sec­ond day of the fair at the lat­est, after it had been pre­sent­ed by VDW Chair­man Dr. Heinz-Jür­gen Prokop at a very well attend­ed press con­fer­ence. umati stands for uni­ver­sal machine tool inter­face. The VDW believes that the name is open, future-proof, inter­na­tion­al­ly under­stand­able and flex­i­ble in its use. The aim is to cre­ate an inter­na­tion­al stan­dard that is used by as many machine tool and con­trol man­u­fac­tur­ers as pos­si­ble world­wide. Espe­cial­ly suit­able for mobile appli­ca­tions, the brand con­sists of a logo and an icon. It is autonomous and is com­plete­ly inde­pen­dent of the VDW. Only the tagline “A VDW Ini­tia­tive” refers to the cre­ator, but will be dropped once the devel­op­ment work is com­plete and the stan­dard is avail­able on the mar­ket. Until then, the high pro­file of the VDW will sup­port the new brand. Part of the so-called Dig­i­tal Way, the VDW had its own stand in Stuttgart with the aim of draw­ing atten­tion to the umati look and feel. One of the high­lights on the stand was the visu­al­i­sa­tion of var­i­ous demon­stra­tion links which had been set up spe­cial­ly for the fair by the par­tic­i­pat­ing part­ners. This was clear­ly rep­re­sent­ed on a screen by IGH Infotec from Lan­gen­feld which used a site plan to show where the con­nect­ed machines could be found across the trade fair. On the stands them­selves the machines were iden­ti­fied by a stick­er. The project part­ners also sig­nalled their par­tic­i­pa­tion in the devel­op­ment of the inter­face with dis­plays at suit­able loca­tions on their stands. Net­work­ing – both real and vir­tu­al – was the watch­word. All those inter­est­ed could pick up a small fly­er on the umati stand which sum­ma­rized the key points. This was print­ed in Ger­man and Eng­lish. The launch was accom­pa­nied by a bilin­gual web­site www.umati.info which will grad­u­al­ly be expand­ed and pro­vide a con­stant flow of updat­ed infor­ma­tion on the project sta­tus in the future. Final­ly, the launch of the brand was accom­pa­nied by a social media cam­paign. Project part­ners can use the #umati hash­tag to report on their umati activ­i­ties on Twit­ter. Inter­est­ed par­ties can com­ment and also ask ques­tions. umati is an acronym, but its mean­ing is easy to deduce for pro­fes­sion­als. The great chal­lenge now lies in rais­ing aware­ness about umati. Take USB or IOS, for exam­ple: these are not self-explana­to­ry, but are now so well known that the acronyms them­selves no longer need to be explained to the gen­er­al pub­lic. If this can be achieved for umati in the pro­duc­tion tech­nol­o­gy world – which the many dif­fer­ent part­ners can help bring about – much of the work will be done.